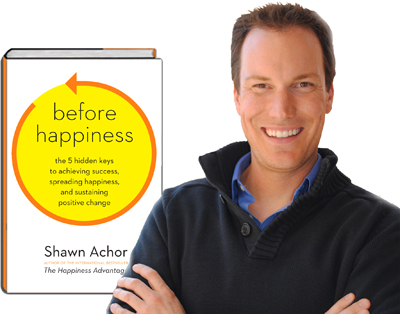 Shawn Achor is the winner of over a dozen distinguished teaching awards at Harvard University, where he delivered lectures on positive psychology in the most popular class at Harvard. He is the CEO of Good Think Inc., a Cambridge-based consulting firm which researches positive outliers — people who are well above average — to understand where human potential, success and happiness intersect. His research on happiness made the cover of Harvard Business Review, his TED talk is one of the most popular of all time with over 4 million views, and his lecture on PBS has been seen by millions. Shawn is the author of New York Times best-selling books The Happiness Advantage (2010) and Before Happiness (2013) as well as Ripple’s Effect. In your book Before Happiness: The 5 Hidden Keys to Achieving Success, Spreading Happiness, and Sustaining Positive Change you explain that the key to happiness and success is a positive reality, and the path to a positive reality is five-step process that ultimately rests upon the foundational belief that positive change is possible, as opposed to habitual pessimism, or blind optimism that does not see the need for change. Below I have included the five-steps detailed thoroughly in Before Happiness. Considering that Ethos3 works with professionals who want and need to be successful with their next public speaking event, can you explain, in a few sentences or less for each step, how public speakers can utilize the wisdom in Before Happiness to overcome the fear, stress and self-doubt that often accompany public speaking? 1. Choose the most valuable reality. I started studying happiness, not initially in psychology, but at the divinity school. Harvard’s program allows you to study combinations of traditions, and I became fascinated by Christian and Buddhist ethics, specifically how the way you view the world changes your actions in it. Before Happiness explores exactly this issue. Before someone makes changes to their happiness, health or success, they first construct a picture of the world. I argue that your mental reality predicts your ability to create positive change. 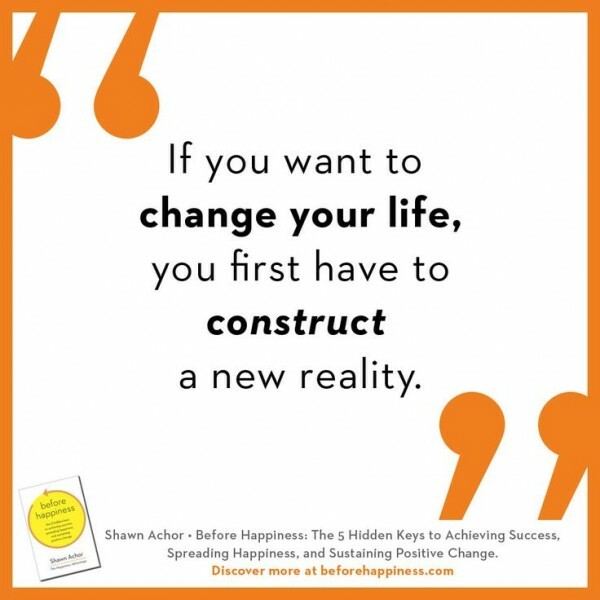 As a speaker, you get to choose what reality you want to present–consider the coffee cup experiment in the book and realize there are always alternate ways to present a situation, no matter what the topic. 2. Map your meaning markers. Remember that success without meaning or joy is not success. Some of the milestones and goals I had set for myself that I hit in the end barely registered to my brain because they were not linked with meaning or joy. I don’t believe success can be pre-defined, but I can say that my working philosophy is that I’m trying to reach the upper bound of my potential that I can maintain while sustaining real happiness in my life. Make success lists BEFORE you make goals. In Before Happiness, I described our research on how our brain accelerates toward goals when a) we perceive progress and b) we see that the finish line is close. That’s why we speed up at 26.1 miles into a marathon. With New Years resolutions, we focus on future goals and forget to prime the brain by writing down our successes for the previous year. Thus we are blind to our progress and our finish line is way off in the future. I’ve worked with over a third of the Fortune 100 companies, and the most successful leaders and professional athletes I’ve observed make success lists. Try it today, don’t write a list of all you need to do, keep a running list of all the things you HAVE done today. When your brain perceives success, it believes your behavior matters. The fastest way to accomplish a goal is to look back at previous successes. Happy people tend to not fill their lives with noise; in fact, in Before Happiness, I describe how they actively decrease noise in their life. These positive individuals seem to limit their intake of negative news stories, they consume news online so as to pick and choose the stories to learn about, they spend the first few minutes in the car with the radio off, they have specified periods during the week where they have no email or calls, and they set a cut off time for work related media after a certain time each day. Take this time to focus on the work that is important to you, not just the work that is at the top of your inbox. As speakers you especially have the chance to work on what researcher Michelle Gielan calls the Power Lead, starting every conversation with a positive like “so happy to have my coffee” or “I’m having a great day how about you” instead of telling people how busy and swamped you are. This changes your interactions and your brain follows your words. The more you say you’re sick or tired, the more sick and tired you feel, right? Same is true for happiness.